How long should you keep your pet in our searchable Lost and Found Database? The quick answer is — as long as it takes to find your lost dog or cat. Here at Pet Amber Alert, we’ve heard many stories of pet owners reuniting with their missing pets after several weeks or even months of searching. Sometimes a missing pet wanders into a new community, far away from home, and is taken in by a well-meaning person who doesn’t know how to reach you. For example, an Arizona ABC TV report tells the story of a cat found three months after being lost. Since the cat’s Pet Amber Alert listing was still active and seen by someone at a community church, it was a good-news story for the missing “Mr. Puss” and his owner. The church was three miles away from the last known location. This means if you don’t find your lost dog or cat in a couple weeks, don’t give up! 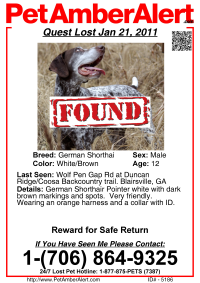 Pet Amber Alert’s state-of-the-art Online Pets-Lost-and-Found Database is here for you now and for months to come. When you call us to report a missing pet or you complete our online Pet Amber Alert form, our Certified Pet Detectives spring into action and enter your pet’s vital information into our advanced online pet profile system. Then, we dispatch that information in the form of phone calls and poster alerts to hundreds of neighbors and pet organizations in the area. When someone finds your dog or cat, they can use our easy online search functionality to locate your pet’s profile and contact information. Even if your pet has been missing for a while… our database can be super-helpful. We keep all pets in our Lost and Found Pets Database for at least 2 years or until they are found. Other services delete pet information after only 90 days! So in the Mr. Puss case mentioned above, it would have been a sad story if they’d used one of those lost-pet services. Pet Amber Alert gives you your greatest hope of reuniting with your pet, no matter how long he or she has been missing. Has your lost pet been missing for a while now? Give our Pet Amber Alert a try online or call our 24/7 Hotline: 1-877-875-7387.